QCT Tips For Breaking The Chewing Tobacco Habit. Its been said that one of the best ways to quit one habit is to replace it with another. In the case of chewing tobacco, there are several options at your disposal to quit with a new habit or a bridge to a healthier lifestyle. Short of going “cold turkey”, there are several cessation techniques you may want to consider. Try replacing chewing tobacco with chewing gum. 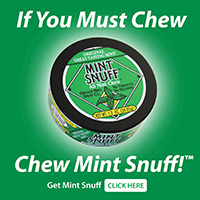 Instead of chewing tobacco use a “tobacco-free” product like Mint Snuff Chew or Mint Snuff Pouches. In addition to using any of these cessation alternatives, you can utilize the 7 tips to help you quit found in the following article by Ginny Green, Editor at My Optimum Health. People who dip or chew can benefit from many of the tools and techniques in a stop-smoking program. Stained teeth, bad breath, mouth sores, cancer, heart disease, money. There are plenty of reasons to stop using smokeless tobacco, which is known as “chew” or “dip.” Everyone has a personal reason for wanting to quit. People who have already quit know it’s tough, but possible. Smokeless tobacco is just as harmful as smoking. And it can be just as hard to quit. Quitting is challenging because you’re likely addicted to nicotine, a drug in tobacco products. Using smokeless tobacco for 30 minutes provides the same amount of nicotine as smoking three cigarettes. Nicotine has a powerful effect on your body. It can make you feel calm but focused, and give you a general “good” feeling. Also, your addiction may not be just to the nicotine, but to the behavior of dipping or chewing. Many things trigger you to use smokeless tobacco each day. Maybe you pop it in your mouth after your morning coffee, or reach for it when you feel stressed. Kicking the smokeless tobacco habit is very similar to quitting smoking. Users may benefit from following a stop-smoking program and adapting some of the tips to their oral tobacco habit. Articles and tools on this website can be relevant to your effort to quit. These seven steps may help you successfully quit your smokeless tobacco habit. Rid your environment of all smokeless tobacco products. Throw away all tobacco pouches or tins from your home, car and workplace. Be prepared to deal with cravings. Carry mints, sugar-free gum, sugar-free candy or sunflower seeds with you at all times. When you get the urge to dip or chew, put one of these items in your mouth instead. Notice your triggers. Perhaps you always dip or chew after meals or while watching TV. Stay busy to avoid relapsing. Notice what friends and family members are doing during this time. This will give you ideas for new habits. You might want to avoid being around other people who dip or chew. Get moving. Stress may tempt you to reach for that pouch or tin. Try exercising, with your doctor’s approval. You will find a helpful Exercise Tracker on this website. This tool allows you to keep track of your activity by minutes, calories burned or steps taken. Your progress will be displayed on a calendar. For more immediate stress relief, take deep breaths to take off the edge. Don’t get discouraged. Quitting smokeless tobacco is hard work. Some people make several quit attempts before they finally quit for good. If you slip up, don’t let it discourage you. Start fresh as soon as you can.